The Black Isle Filling Station, 7.00pm Tuesday 29 May at Gordon Memorial Hall, Rosemarkie. This is not a church but a group of Christians from different churches gathering together in praise, listenning to a speaker and singing hymns. Light refreshments available. Perhaps you would like to give it a try, its a bit like a top up between Sunday services. This month the speaker is Jim Rettie from The Highland Healing Fellowship. The 2017 annual accounts for Kiltarlity Church of Scotland have been approved by the Kirk Session and are available to download. They will be presented to the congregation at the Stated Annual Meeting on Sunday 18th March. 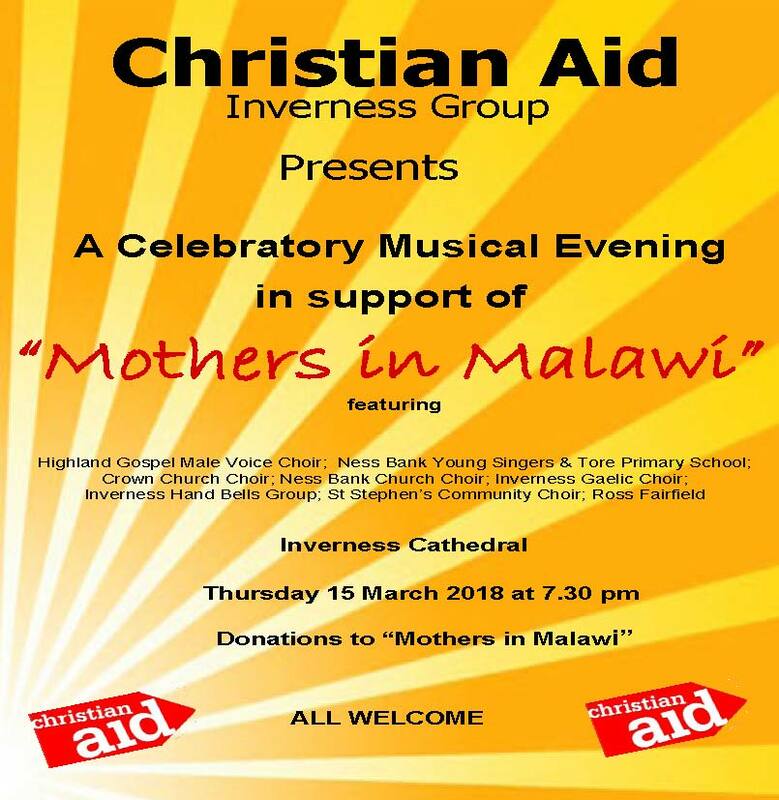 Please come and support this Celebratory Musical Evening in Inverness Cathedral in support of “Mothers in Malawi” on Thursday 15th March at 7.30pm. Inverness Presbytery has published its Presbytery Plan, which sets out its strategy for the next 10 years. The detailed document can be viewed by clicking on the above link and is summarised below. Inverness Presbytery Planning Committee believes that there are too many buildings for the church to sustain. Their focus now seems to be on new and developing areas of population (e.g. St Columba New Charge and Tornagrain – and the General Trustees have indicated that a new church in Tornagrain can only go ahead if charges and buildings are reduced elsewhere). What does this mean for Kiltarlity and Kirkhill? Nothing will change until there is a vacancy (or unless the minister agrees to the change), but if a decision has not been made on which building to close by that time then Presbytery will make a determination and the vacancy will be “sisted”. This means that if we have a vacancy, Presbytery will not allow us to start the process of finding a new minister until we have decided which building to close. Presbytery meet on Tuesday 6th February 2018 to discuss and vote on the plan. Both churches have been invited to send a joint delegation of 3 people to represent the two churches. We have the opportunity to speak for 5 minutes and to propose an amendment to the plan. 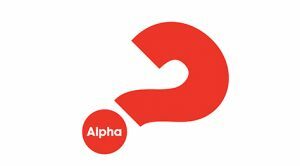 The two Kirk Sessions are meeting on 10th/11th January to discuss how we plan to respond. We have until 23 January to submit any amendments. If you have any feedback, suggestions or questions then please contact either Jonathan Humphrey, David Garvie (Kiltarlity) or Frances Grant (Kirkhill). 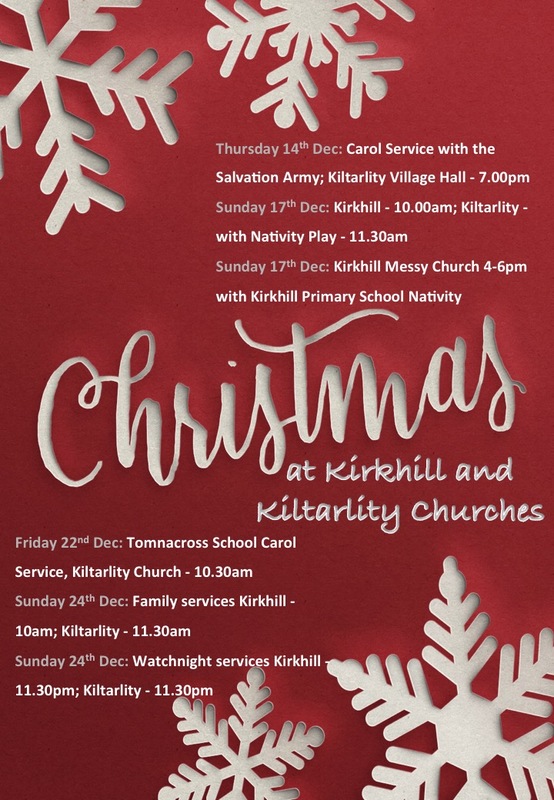 Kiltarlity Church is starting a Friday Club for primary school children on Friday afternoons from 12.15 till 3.30pm during term time and when the children are in school. The idea of this is to encourage use of our old church building, and also to provide a small service to hard-working parents who struggle to find after school care for that extra half day. The club will be under the umbrella of the Church and run by members of the Sunday Club and the Open the Book team whom the children know well. It will be in essence like most after school clubs with games, crafts, art, music, projects etc and will obviously have a little Christian content. Children will be expected to bring a Grab & Go lunch or similar, and be escorted by us across the road to eat in the church. We won’t prepare food, though drinks and biscuits will be on offer. Anyone interested must register in advance as this is definitely not a drop in club. Parents will also be expected to have a level of commitment, letting us know if a child cannot attend or wishes to stop coming. We aim to take about 20 children full time, but an extra child could be catered for on odd occasions provided we are informed and a proper registration is completed. The Church Friday Club will be free, and places will be available on a first come basis. If you are interested, please email Sheila Moir with details of children. Registration forms will be also be available on line. The team from “Youth With A Mission” are back in Kiltarlity and Kirkhill again! After the success of their visit last year, they will be coming back from Monday 12th to Sunday 18th June. 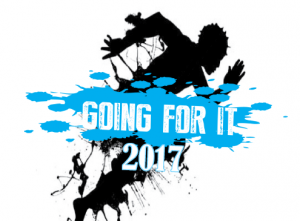 There will be fun-packed events for primary and secondary school children and for families. 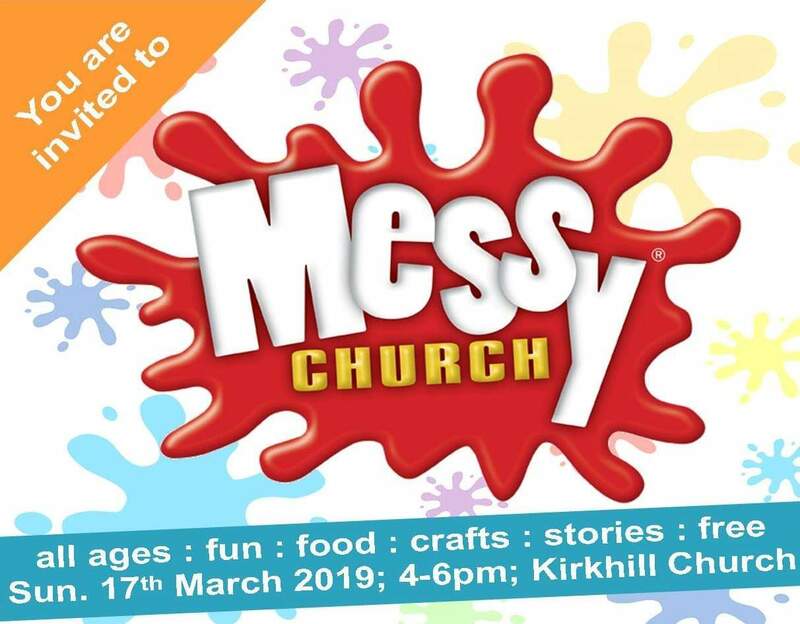 Messy Church is coming to Kirkhill and Kiltarlity! 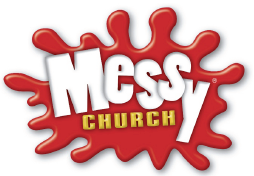 We will be starting a trial of Messy Church in Kirkhill on Sunday 18th June from 4pm – 6pm. If this is successful then the aim is to do this monthly, with a combination of Kirkhill and Kiltarlity. For further details see the flyer or contact Rev. Jonathan Humphrey by email or 01463 831247. Our churches been going through a process of review and planning, culminating in ‘Local Church Reviews’ – one for each church. These documents set out the ‘story’ of our congregations and present 5 year action plans with very specific goals. The plans have been written by the Kirk Sessions and the action plans are heavily influenced by Congregational Meetings that were held in October 2016. These plans were approved by Presbytery in May 2017, and the approved documents can be downloaded here: Kiltarlity LCR and Kirkhill LCR. You can also read the report that was sent to and approved by Presbytery: Presbytery LCR Report. Feedback is very welcome and should be directed to Jonathan or an elder. The latest (March) Presbytery Bulletin is now available – just click the link, which should take you to the Bulletin in your web browser. 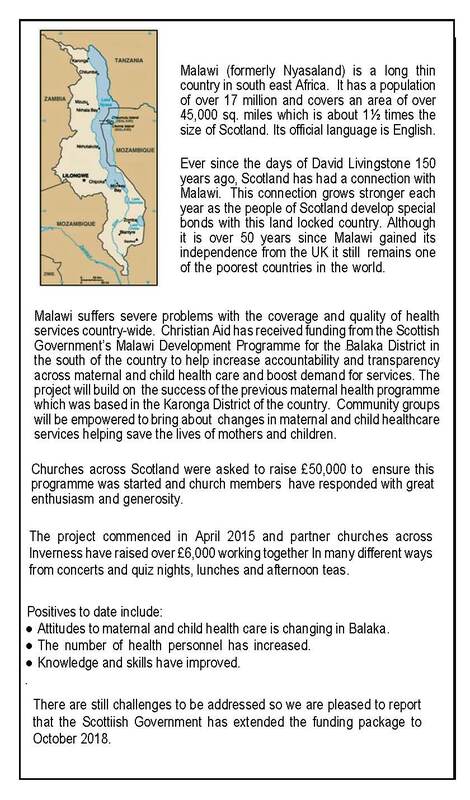 Thank you to everyone who reacted after the presentation last Sunday about The Highlands Support Refugees. 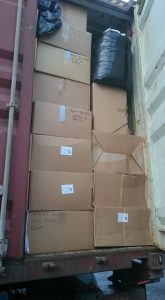 On Saturday the most recent container to be shipped was loaded and it set off on its journey to Syria. It’s gone to Syria rather than Lebanon due to current administrative issues with aid arriving there. That is now around 62 tonnes of aid dispatched to refugees since THSR set up just over a year ago. If you would like to help in any way at all please go to their facebook page at https://www.facebook.com/groups/thehighlandssupportrefugees. 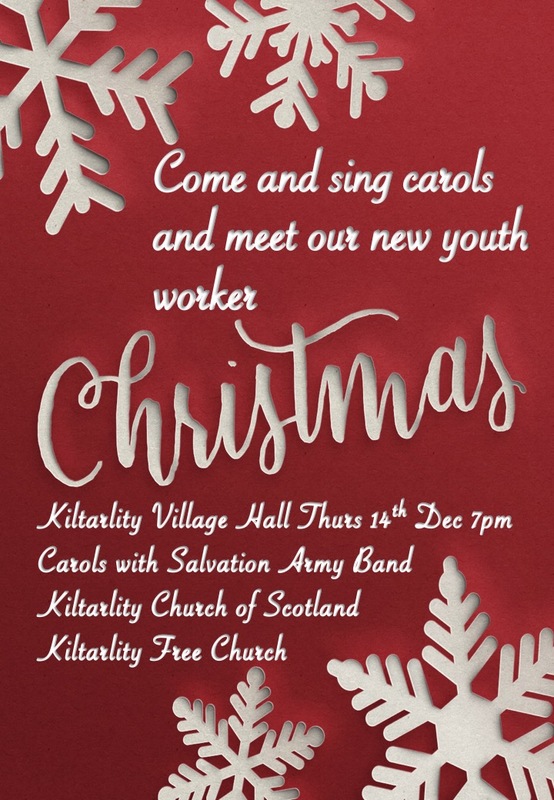 The offering from Kiltarlity’s watchnight service will be donated to THSR, so do please come along and support. 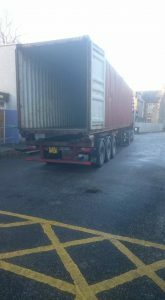 I will continue to provide updates for the church on what is happening at THSR and I hope to organise a donation of clothes in the New Year. Please remember the story about the starfish! A new online Advent calendar will bring the true spirit of Christmas to life with 25 specially created videos made by members of the Church of Scotland ministries team. Each of the thought provoking, often hard-hitting, films feature trainee ministers, probationers, a deacon and youth workers from across the country who reflect on a word that symbolises the true meaning of the season. Half of the daily messages, which are also inspiring and uplifting, have been recorded by women and follow on from the Church’s successful Advent campaign last year which saw 24 short videos viewed more than 180,000 times. Click here for more information, or sign up here. 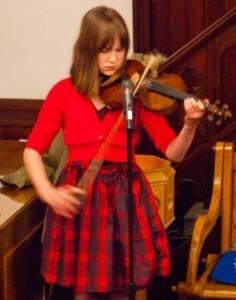 Tuesday 26th January saw Kirkhill Church hold a Ladies’ Evening in aid of the Elsie Normington Foundation. This was a fun evening with a Valentine shopping theme. We had seven vendors: The Corner on the Square, Beauly; Far and Away Travel; The Men Shed; The Potters House, Kiltarlity; Georgia May; The Drawing Room; Caton Creations; plus an information stall about the Elsie Normington Foundation project. The Elsie Normington Foundation plans to build a specialist play centre, respite wing, community coffee shop and some supported housing for children and young adults with learning disabilities in Inverness. We need your help to raise £4 million for this project. Young people need relevant facilities and services while parents need to be supported appropriately in their caring role. There are 1,679 children with additional needs in school and 722 children who are registered disabled in Highland. Over 120 women from Kirkhill, Kiltarlity and the surrounding area gathered to buy gifts for loved ones, chat and connect with friends old and new. We raised over £1,000 for the Elsie Normington Foundation. The Kirk Sessions of both churches had a very productive ‘away day’ on 27 September 2015. The purpose of the day was to begin a process of forming a shared vision for the future of our two congregations and identifying priorities in terms of worship, witness, service and mission. You can read more details about what was discussed and what actions were agreed here. Young Life in the Highlands here in Kiltarlity, Kirkhill and Beauly is only just beginning. We now have a committee, which is dedicated to bringing a worker here to this area. There is a lot of work before us in making this a reality, including job description, raising funds and finding the right person. This is not our work alone -the Lord provides -and is already at work in the lives of young people in this area. He has brought those who don’t know Him to camp and to club nights. We need your prayers to continue this work, so that we might see all young people with the opportunity to understand and respond to the Gospel of Jesus Christ. The 120th Anniversary of the founding of Ward law Guild took place on Wednesday 14th October when 22 members and friends attended and spent a most pleasant afternoon. Six ladies were presented with Long-Service Certificates ranging from over 10 years to over 70 years loyal service for which they have our sincere congratulations. ‘Open the Book’ Reaches 2,000 Schools! Bible Society says it is ‘thrilled’ that its initiative ‘Open the Book’, can now be found in 2000 registered primary schools, and that there are 11,000 volunteer Bible storytellers going into schools across the UK. ‘Open the Book’ is a three-year rolling programme of themed and dramatised Bible stories, which are presented by teams of volunteers, free of charge, to primary schools. Volunteers present Bible stories in primary schools in an accessible and enjoyable way and provide a resource that assists schools in meeting their statutory collective worship obligations. The volunteers use drama, mime, props, costume – and even the children and staff themselves. All storytellers agree to a strict code of conduct and follow the guidelines in the Open the Book handbook. Volunteers stick to the script and outline for each session and present the story simply, without addition or improvisation. They don’t teach or preach, but simply tell stories. They allow each story to speak for itself, liaise closely with schools and show respect and sensitivity to those of other faiths. After a vacancy of 3 years, and a long and widespread search for a minister, Dr Jonathan Humphrey was ordained and inducted to the ministry of the Kiltarlity and Kirkhill churches on Friday 27th March 2015. 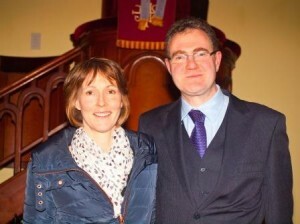 Jonathan hails from Penicuik, and from his previous church in Gorebridge, some 50 faithful followers and friends travelled to Kiltarlity to join with the congregations of both churches and, together with Kate and Jonathan’s family, support his ordination and induction. In total 200 + persons attended the service – wonderful to see the church so “full” and wonderful to join in fellowship and worship with so many. The singing was magnificent, hymns accompanied by organist Tonya. The service was conducted by Inverness Presbytery, and led by Rev Mike Robertson, recently inducted minister to the Barn Church, Culloden. 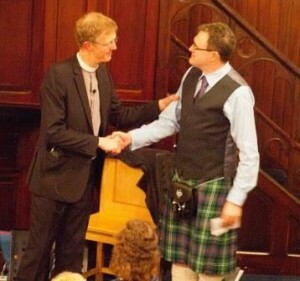 The address was given by Rev David Scott. Rev Alasdair Younger, Moderator to the Presbytery ordained Jonathan to the service of the Church and inducted him to the charge of Kiltarlity and Kirkhill. Jonathan was welcomed in the time immemorial way of the giving of the right hand of fellowship from all presbytery members present. Formal proceedings over the assembled company, almost without exception, adjourned to the Wardlaw Church, Kirkhill for a delicious buffet supper prepared and served by the ladies of both churches. Thereafter a varied social filled appropriately with a blend of music, solo singing, humorous speeches and fellowship followed, all in all a fitting welcome for Jonathan and Kate, and their sons, Calum and Robbie. Jonathan was presented with a gift of a be-ribboned log, this much to the amusement of both himself and all present. Not to worry ….. this single log is to be suitably augmented by the delivery of a vast quantity of prepared timber to ensure that Jonathan, Kate, family ….. and possibly visitors to the manse too, are kept warm through the long winter nights! Their recently installed wood burning stove will be working overtime! Jonathan also received a Lovat Shinty Club flag, presented to him by Rev Joe Barnard, very recently ordained and inducted to Kiltarlity Free Church. Kate received a beautiful bouquet, as did Mrs Brigid Donald – wife of Rev Peter Donald. 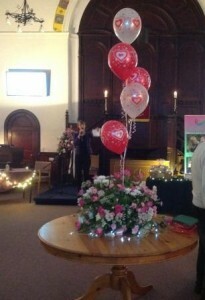 Sheila, in presenting the flowers to Mrs Donald, “returned” her husband to her. Peter has been a faithful and so diligent interim moderator to the two churches, never failing in his duty to both, through presiding over Kirk Session and Deacons’ Court meetings, conducting services in both churches as required, ministering to the folks of each parish, supporting and encouraging the work of the nominating committee ….. in other words, invaluable to us all. Peter, like Jonathan, was presented with a similar be-ribboned log. It is the fervent and genuine hope and prayer of the folks of both parishes that Jonathan and Kate will feel very much at home in these communities and that he will minister to all for many years to come.